A woman holds up a glowing martini glass in front of a green-lit bar. The mix of light and shadow draw the eye, but it’s the subject matter that piques interest: a novel of magic and mixology. 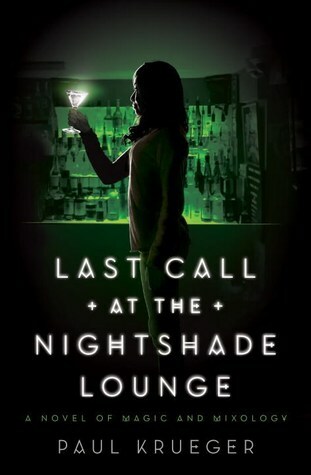 Last Call at the Nightshade Lounge is, according to the book blurb, an urban fantasy that “blends alcohol and magic with a dash of wit and strains it all through the muddle of postcollege life.” (Love the use of mixology terms used seamlessly here!) College grad Bailey Chen becomes a bartender at the titular bar and is introduced to the hidden world of demons and monster-fighting in Chicago. She and her fellow bartenders mix up magical drinks used to defeat evil creatures stalking the streets. A bar (or lounge or tavern) whether seedy or classy is a common trope of so many genres. It’s the place characters stop in at the beginning of a journey, the go-to location for information or tracking down a suspect, the scene where bad guys hang out or good guys go to unwind at the end of a mission. And let’s not forget about the location as an arena for a fight or sprawling brawl. Quite naturally, the story here begins in a bar with an off-duty Chicago cop drinking a bit too heavily after “failing his sergeant’s exam for the fifth time.” He refuses the offer of a cab and heads home on foot only to encounter a hound-like creature. Buzzed, out-of-shape Officer Jim Regan seems like a goner until he’s saved by Bailey—”black, female, tall, dreadlocks”—toting a stop sign and wielding it like a battle axe. Chapter One then flashes back to before Bailey was so capable and experienced, beginning her origin story and first experiences fighting tremens, the demon-like creatures of the night. And the bar, the titular Nightshade Lounge, is the central location for all of it. It’s a novel take on the urban fantasy genre. There’s even a book within the book known as The Devil’s Water Dictionary, an “archive about alcoholic arcana and alchemy”, portions of which are interspersed throughout the book with related lore and actual cocktail recipes.